Returning to Dr Mabuse almost 30 years after Testament of Dr. Mabuse, Fritz Lang gave us a film that feels very different from its predecessors. Lang returned to the series after Artur Brauner of the CCC films — the first German studio to open post-war — lured him back to Germany. Brauner was a huge Lang admirer, and believed Lang working for CCC could give the struggling start-up some status. Lang’s first two CCC films were critical flops but commercial hits. Brauner suggested Lang remake Testament of Dr. Mabuse, Brauner’s personal favorite. 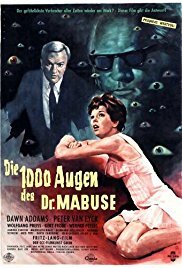 Lang gave him a new Mabuse film instead — 1960’s The 1,000 Eyes of Dr. Mabuse (Braumer would get his Testament remake from others, later). Watching this one so close to seeing The Gambler and Testament makes the differences much more obvious than first viewing. The Gambler put Mabuse front and center. The focus is on his plans, his crimes, and the futile efforts of the good guys to stop him. In Testament, Mabuse lurks in the shadows, but his gang still takes up a lot of screen time. In 1,000 Eyes, things are murkier. 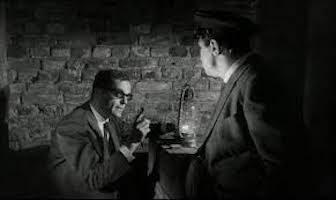 Except for Mabuse’ stone-cold, shades-wearing agent Number 12 (Howard Vernon), we don’t see much of the underworld. Our viewpoint is that of American businessman Henry Travers (Peter van Eyck) and Inspector Kras (Gert Frobe), and they don’t know more than we do. The film opens with Number 12 pulling a hit on a TV reporter in traffic. One cop recognizes the kill as patterned on one of Mabuse’s old crimes. In addition to investigating the hit, the cops are also looking into the Hotel Luxor, which they’ve tied to a string of Mabuse-style chaos-causing incidents. The blind psychic Cornelius (Wolfgang Preiss) gives Kras cryptic hints and warnings. Over at the Luxor we meet Travers, in Germany on business; Marion (Dawn Addams), a mysterious suicide Travers saves and falls for; and Mistelszeig (Werner Peters), a chatty insurance salesman happy to discuss how he vets clients by astrology. We also meet Jordan (Preiss again), Marion’s psychiatrist. Watching the characters chat, flirt or investigate doesn’t give us, or Kras, much of an idea what Mabuse’s game is. Travers does learn that the room next to Marion’s has a two-way mirror. Marion keeps holding Travers at arm’s length, finally confessing she’s married to an abusive husband. When said spouse attacks Marion, Travers sees it through the mirror, breaks into her room and kills the husband. Jordan agrees to save Marion from scandal by hiding the body, but it’s a trick: the man’s actually alive. Only it’s a double trick: Number Twelve kills him for real. In the last half hour, everyone pulls off their masks to show who they really are. 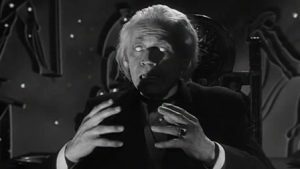 Dr. Jordan is Mabuse. Cornelius is a disguised Jordan. Mistelszweig appears to be a crook striking a deal with Cornelius, but he’s really an undercover Interpol agent. The moneygrubbing hotel manager is an agent of Mabuse; Marion is too (David Kalat thought that a much cleverer twist than I did). When Travers catches on, Marion tries to get him out of the Luxor, warning that every room is wired for surveillance. Too late: Mabuse has them dragged to his basement lair, the nerve center for his spying (which helps him plan all those crimes worrying the cops). Trapped there, Marion confesses to Travers that once they married, Jordan would arrange an “accident,” then control Travers’ businesses through her. For a Cold War story, the nuclear angle was probably inevitable. And with Mabuse, there has to be a mind-control element: it turns out Marion isn’t a bad girl, just under hypnosis (this feels very shoehorned in). She and Travers get together in the end while Mabuse apparently drowns fleeing the cops (spoiler: he doesn’t!). This was the last great film in the series (though the next one, Return of Dr. Mabuse, is good). Frobe, Peters and van Eyck would all play roles in subsequent 1960s Mabuse films. Preiss would play Mabuse in more films than Rudolf Klein-Rogge, but with very little screen time (other actors played Preiss in “disguise.”). The surveillance angle has aged, not because surveillance is old hat, but because being on camera everywhere is now so routine. I don’t think that hurts the film. Now that my schedule has improved, it shouldn’t be too long before I blog about the first post-Lang film, Return of Dr. Mabuse. When I read the quote on the title, I thought we might be talking about Trump, cause that could easily apply to him as well. Mabuse would eat Trump for lunch. Actually he’d eat him for a mid-morning snack. In terms of thrills and great plot, this is my favorite of the Mabuse films. It’s got a quicker pace, yet still focuses on the dramatic elements. The subsequent films tend to be more more horror/thrill-based. There is a nice thematic sequel to this, via British author and film reviewer Kim Newman, in his Angels of Musik. The group, a pseudo-Charlie’s Angels, where Charlie is the Phantom of the Opera and the Angels are all female characters from literature, investigates Charles Foster Kane’s Euro-Xanadu, with a casino/hotel that is being used for underworld payments. Mabuse is the architect of the casino/hotel, with an elaborate surveillance system. It’s a lot of fun. The original story appeared in the Tales of the Shadowmen series, from Black Coat Books, and it was expanded in Newman’s Angels of Musik novel/anthology, from Titan Books.